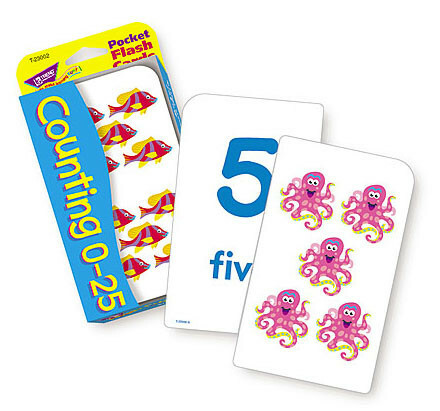 Make learning to count fun for children with these durable Counting 0-25 Pocket Flash Cards! A great educational game for your classroom. Pocket Flash Cards make learning numbers fun! Use numbers 0-10 for early learners and as your child progresses add in the numbers 11-25. These cards can be used by one, a pair, or a small group for hours of number fun you can count on! Count & Say. Lay out all the picture cards facing up. Count the objects on each card and say how many. If you’re not sure, ask a parent or friend for help. Flip cards to check answers. See & Say. Look at each numeral card and say the name of the numeral. Put the cards you answered correctly in one stack and count the cards to get your score. Flash & Guess. Shuffle just the numeral cards and have a partner show you them, one at a time. Tell which numeral comes next. Hands Down. (2 players). Sort the cards and use just the numerals. Each player is dealt half of the numeral cards face down. On the count of three, both players flip their top cards face up. The player with the higher numeral gets to keep the pair. Play through all of the cards and then count the cards to see who won. Numbers, Numbers. Everyone knows that certain things always come in certain numbers. We all have two eyes and two ears, eggs come in cartons of 12, one can buy cans of Coca Cola in packs of six, twelve, or twenty-four, and so on. Can you think of other numbers that items always come in? Brainstorm with friends or family. How many can you think of? What’s Missing? With the numeral cards arranged from 0-10, close your eyes and have a partner remove one card. Open your eyes and guess which card is missing. For each right answer, give yourself one point. When you’ve scored five points give your partner a turn. Now try numbers 10-20, 15-25, and 0-25! Numeral Up. Sort cards into two piles: picture cards and numerals. See if you can match the card with two dolphins on it to the card with the “2” on it. Can you find matches to all the cards? Words Up. Sort cards into two piles: picture cards and number words. See if you can match the card with two dolphins on it to the card with the word “two” on it. Can you find matches to all the cards! Number Line. Sort the cards and use just the numerals. Lay them in order from left to right, starting with 0 and ending with 25. Mix up the cards and arrange them to count backwards from 25 to 0. For more fun, try to make a number line using the word cards. Skip It. After you know all of your numbers you can try a new way to count called skip counting. Try counting by even numbers (0,2,4,6,8 …) and odd numbers (1,3,5,7…). Then try counting by threes (0,3,6,9,12…), by fours (0,4,8,12,16…), and by fives (0,5,10,15,20…). It’s a neat way to count! Game play instructions and activities sheets included.